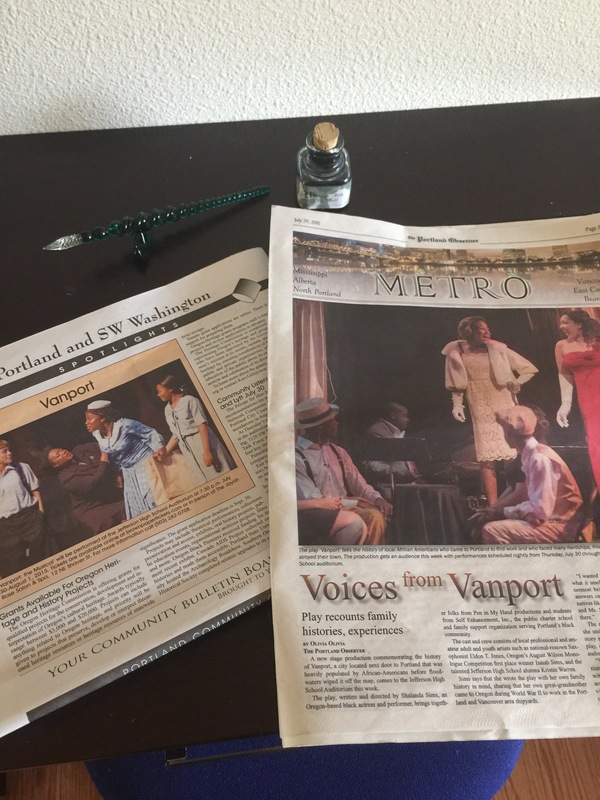 Tonight is our final performance of Vanport, the Musical, written and directed by (my best friend and soul-sistah) Shalanda Sims. And I am feeling some kinda way because I still have problems with “good-byes”. For the past three decades we the descendants of Vanport have had to say our good-bye’s. We have had to say “good-bye” to Ma and Pop restaurants, school buildings and parks. We have had to say “farewell” to Grandmother’s house, beauty salons and the unspoken hangouts like Walnut Park Fred Meyers and corner stops like 15th in Alberta. We have said “see you on the other side” of church buildings and funeral homes. We have grieved and recovered, grieved and recovered until our tear ducts have dried and there is nothing left to hold on to. So I return weekly to Woodlawn Bakery the place that use to be Sis. Ransons dry-cleaners. I slowly drive down Prescott and I beg my mind to recall every memory of Granny’s house, Mt. 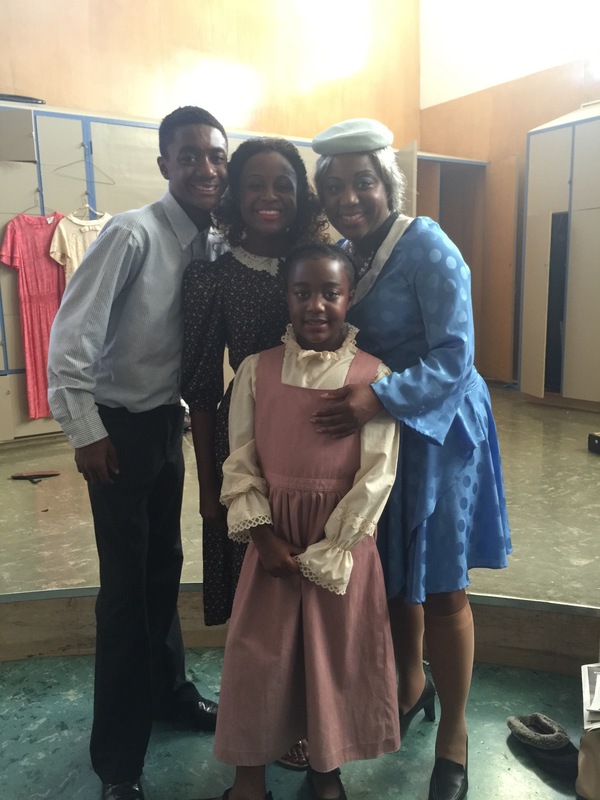 Sinai Baptist Church and Marantha musicals. I sit in front of 3207 NE 11th and count every family member in place on the porch. I can see my neighborhood still in tact and all of my family members vivid in my head-however these cherished visions are not the reality of what is staring back. And I feel lost all over again. Forgive the cliche-but I am -“we are -Vanport descendants and we are lost (again)-without a home”. But for three little months-we felt found. My family and I have had the privilege to dive deep into the sights, sounds and spirit of a “once upon a time” place created by The Sims. Our special place, free of princesses and castles has a foundation built on cultural traditions, oral histories, everyday legends, hard work and beauty of soul and art. It is a place Shalanda wrote about to honor not only her family journey but so many other’s-including my own. As gentrification jungles continued to swing and expand on Williams,Vancouver and Martin Luther Kings Blvd we built our set, our spirits and our community-alive again. Long meetings, late practices and lingering meals centered around representing our people strong, stabilizing our voices and re-connecting our youth to their history and who they really are- left us satisfied and recommitted to “the struggle”. The struggle being the very hard work of preserving the remnant of a people who have been flooded, pushed out and gentrified with not only one wave of loss, but three in the last three decades. But we are still here. Deeply grieved we are no longer in a centralized neighborhood but we are centered strong in no longer keeping quiet, watering down or allowing others to speak for us about our story. My parents and Aunt Jean, now a vibrant 70+ years of age (who was only six years when the flood hit Vanport) gave big hugs and proud knods of approval and praise for the hard work our cast took in preserving the integrity of Vanport last night. “You made us so proud. You all keep telling our stories.” Aunt Jean beamed with pride. With those words, I was instantly transmitted to the living room carpeted floor of my Granddaddy’s house. I was nine years old again and I was smiling back with pride in hearing the accounts of my grandparents life in Vanport. My whole life I wanted to know what it felt like to live deep in community with people who treat you like family and will be there for you in times of trouble-the way Granddaddy had. And we had done just that! 1. No matter what is taken from you- you can always rebuild. 2. You are only as strong as the respect you give to your elders-honor them always. 3. Long prayers, a song in your heart and good fried chicken can ALWAYS make everything instantly alright. 4. Love and longing is the only way to survive “the storms of life”. 5. A consistent hard work ethic will always set you high above the rest. 6. Always remember where and who you come from. 7. Live today as if tomorrow was never promised. These are the ways we will once again piece ourselves back together. These are the ways we will find peace and move on. These are the ways we will honor those who blazed the trail for us to follow. These are the ways we will keep telling our stories strong. Walnut Park Fred Meyers was a pit. Fred Meyers shut down the Historic Killings worth location because they could not protect their products from theft. They had black gangs fighting over the parking lot and local black leaders were no help. Let’s be real about how we allowed the black community to fall apart. With all due respect I strongly disagree and did not witness the Fred Meyers you are speaking of. As a little girl I frequently went with my Grandfather to this store. His friends stood as guardians in the entry. With a police department right next door I don’t understand how this place grew out of control. Gangs were a problem back then and many Black leaders including my father partnered with police partnered with authorities to dismantle the brewing destruction. To blame an entire community for not protecting itself from gangs/crime is unfair. We fought hard then and continue to fight but we have never been a high priority to those in power. I witnessed many gang members taking off their hats pulling up their pants to give respect and honor to their elders. My father suited up in many bullet-proof vests putting out fights and retaliations. Yes the police station came later. In my reflection I was trying to communicate how something so precious as a legacy of community could go unprotected with a police station oddly being built to replace what was once there. And you are right I am being selective in my thinking because I am sorting out what I chose to remember. There is no perfect community and I am saddened by what you shared here. Hurt people-hurt people. There were shootings around the store. In the parking lot and armed robbery in the parking lot of the customers. Can you imagine how the shop lofting was? They stopped doing anything about the shop lifters because many of them would pull out a fun if caught. Then gangs started fighting over the parking lot. That is a devastating number Bro. Fred. But what about the 500 that were saved? What about the gang members who joined because they had no other supports to hold on to. I don’t support gang violence and those that prey upon youth-abusing their power of influence and community. But I also understand that the historical dismantling of our Black community didn’t start with gangs. The layers of poverty, misuse of privilege and hundreds of years of tearing the Black family a part has been systematized in the America we live in today. And there are many of us with Gods help who are still fighting to keep this remnant alive and well.